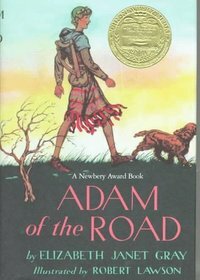 Awarded the John Newbery Medal as "the most distinguished contribution to American literature for children" in the year of its publication. "A road's a kind of holy thing," said Roger the Minstrel to his son, Adam. "That's why it's a good work to keep a road in repair, like giving alms to the poor or tending the sick. It's open to the sun and wind and rain. It brings all kinds of people and all parts of England together. And it's home to a minstrel, even though he may happen to be sleeping in a castle." And Adam, though only eleven, was to remember his father's words when his beloved dog, Nick, was stolen and Roger had disappeared and he found himself traveling alone along these same great roads, searching the fairs and market towns for his father and his dog. Here is a story of thirteenth-century England, so absorbing and lively that for all its authenticity it scarcely seems "historical." Although crammed with odd facts and lore about that time when "longen folke to goon on pilgrimages," its scraps of song and hymn and jongleur's tale of the period seem as newminted and fresh as the day they were devised, and Adam is a real boy inside his gay striped surcoat.